This movie has a lot to answer for. Because for every wisecracking bad guy, every smartass remark from a world-weary hero, every dopey action picture with a protagonist who thinks he's too smart for the room�in short, the entire career of Bruce Willis and the complete works of Shane Black, among many, many others�we have Butch Cassidy and The Sundance Kid to blame. But having spawned generations of pale imitations shouldn't dim our appreciation for the genuine article�we can all phone in just about every story beat of every buddy action picture from the trailer alone, because so many have tried and failed to live up to the high standard set by Butch and Sundance. But watching the movie is sheer pleasure, even if its legacy at times feels unforgivable. Who are those guys? Paul Newman plays Butch, the leader of the Hole In The Wall Gang, a notorious ring of train robbers in the old West, and Butch's sidekick and prot�g� of sorts is Sundance, in a career-making performance from Robert Redford. They're wry and winning, but, given their line of work, they've invoked the wrath of too many of the rich and powerful�they're wanted men, and even Butch's leadership of his crew is at stake. They're forced, then, to hightail it, as they are pursued by a superposse of the best lawmen in the West, who track the duo with what seems like a relentless clairvoyance, pushing Butch and Sundance to the brink of the West, then to New York, and then to seek their fortunes in Bolivia. These guys are the very definition of lovable scoundrels�they're robbers, sure, but they pride themselves on conducting business with a certain panache and with an absolute minimum of violence. And as so many Westerns are, this one is very much about the death of the West, and the lightning speed of mythologizing�that stupid oxymoron "instant classic" comes to mind with the stories that these guys tell about themselves, and the pride they take in the reading of their press clippings. So much of the fun of the film, certainly, comes from the chemistry between its two stars, both of whom are just tremendous here. Newman's Butch is wry and self-reliant, and Redford's Sundance lives by his own code�we learn a little more about the latter through his relationship with Etta, a school teacher drawn to the bad boys, played by the lovely Katherine Ross. She's good, but the boys get to have all the fun; still, between this and her role as Elaine Robinson, she's one of the most underappreciated, iconic actresses of the late 1960s. And there's at least as much star wattage on the other side of the camera. William Goldman's screenplay is smart, fun, informed and propulsive, the necessary document for just a flat-out good old time at the movies. It's well served by director George Roy Hill, whose clean style and appreciation of his cast never flag; and there's extraordinary work from cinematographer Conrad Hall, which gives us both stunning vistas of the landscape and generous, flattering, expressive close-ups of the actors. Particularly notable, too, is the film's score, most famous for Raindrops Keep Fallin' On My Head�it's a nice song, all right, but some of the Burt Bacharach bubadubadoo stuff feels particularly dated. The film moves relentlessly to its climax, a shootout that's the stuff of legend, both historically and cinematically, and it's the rightful apex of a movie jammed with wisecracks and one-liners used to fend off the characters' sense of doom. It's about as much fun as any movie you'll ever watch, and all of what you've just read is true. Image Transfer Review: You certainly lose something by not seeing this on the big screen�Hall's work just can't have the same sort of majesty at home�but this is a strong transfer, especially impressive as the film was made in an age notorious for the inability of film stock to hold its color over time. Occasional discoloration mars the transfer, but overall it's a solid effort. Audio Transfer Review: The sound mix isn't nearly as ornate as the cinematography, and the film is light on musical scoring, so you'll hear a fair amount of hiss. 8 Other Trailer(s) featuring From the Terrace, Hombre, The Long, Hot Summer, Quintet, The Towering Inferno, The Verdict, What A Way To Go! Extras Review: There have been a whole rash of home video releases of this movie, but this one rightfully earns the Collector's Edition moniker that appears on the DVD case, even if the extras package occasionally demonstrates some confusion about dates. 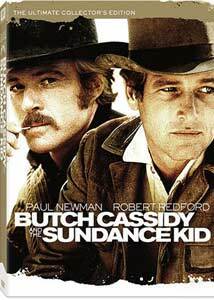 Along with the film on the first disc is The Making of Butch Cassidy and The Sundance Kid (42m:09s), which was produced in 1968, and not, as the menu indicates, in 1994. It's a terrific collection of footage from the set, and includes audio interviews with Newman, Redford and Goldman, but the anchor of the piece is Hill, who comes across as a self-fashioned manly man, and a driven director sweating out this huge undertaking. The first commentary track was ported over from an earlier laserdisc release�it features observations from Hill and Hall (both of whom, unfortunately, have since died), along with lyricist Hal David and associate producer Robert Crawford Jr., also responsible for the making-of piece. There are lots of free-ranging observations about the production, with a particular emphasis on the casting of Redford, despite the studio's initial objections�at times both Steve McQueen and Jack Lemmon were in talks to play leading roles. Hall is especially winning here, discussing particular shots, and reminiscing about his offscreen romance with Ross. Goldman flies solo on the second track, and his observations may sound familiar, if you've read his excellent book, Adventures in the Screen Trade. He's got a potty mouth, and gives an overview of the general state of screenwriting; he ascribes some of the film's initial bad press to the attention he garnered for selling this as a spec script for the then-record sum of $400,000. (Still not a bad payday, forty years later.) He's especially good discussing this movie in the context of the death of the Western, for Butch and Sundance, on some level, are heroes who run away. He flags as the running time of the picture goes on, but he's brutally disparaging about film critics: "They're all failures." I'm guessing he's not a dedicated dOc reader, then. Disc Two has more than its fair share of action as well, starting with All Of What Follows Is True: The Making of Butch Cassidy and The Sundance Kid (35m:26s), featuring new interviews with Goldman, Newman, Redford, and Ross (who seems to have had too much work done), and, among others, Lawrence Kasdan, who tried to channel the spirit of Butch and Sundance in Silverado. This covers much of the same territory as the commentary tracks, focusing particularly on the impact of the film on Redford's career. The Wild Bunch: The True Tale of Butch and Sundance (25m:11s) takes a look at the liberties that the movie took with the truth, and features comments from a handful of historians�even they can't resist the iconic power of Newman and Redford, though. Burt Reynolds is your host for the multi-coloned History Through The Lens: Butch Cassidy and The Sundance Kid: Outlaws Out of Time (01h:30m:15s), made in 2000, and featuring many of the filmmakers�it's clear that they've been telling these same stories for years now, though the historical images of the West here are especially interesting. What are labeled as vintage interviews date in fact from 1994�perhaps the dates were flopped with the original making-of documentary?�and you'll find discussions with Newman, Redford, Ross, Goldman and Bacharach, along with Maybe Some of What Follows Is True, a compilation of conflicting memories of the production, complemented by All of What Follows Is True, in which fondness for the project is unanimous. Most tantalizing is a deleted scene, even if it's got only subtitles, because the original audio has been lost�it features Butch and Sundance watching an early film about themselves and shouting back at the screen for getting things wrong, and assembled on an optional audio track are comments from Hill on the scene, and why ultimately it was cut. Production notes include a raft of correspondence, including story memos and budget projections. Three original trailers accompany a Newman trailer gallery; and finally, an alternate credit roll for the end of the film was discarded as a bit too generic. Look past the somewhat dubious legacy of this movie, past its eponymous film festival and the line of salad dressings it has inspired, and what you've got here is the granddaddy of all buddy pictures�it's a smart and funny Western, with great acting values, exquisite craftsmanship, a barrel full of memorable lines and characters, and a couple of images and sequences that are unforgettable. It's tricked out in this two-disc set, and is most highly recommended.